Beach weddings entail more budget and preparation for the couples. Yet there are ways to organize and enjoy such a memorable event without experiencing too many hassles. Flowers. Flowers like wild orchids are good choices. Choose flowers that do not wilt easily under the sun. 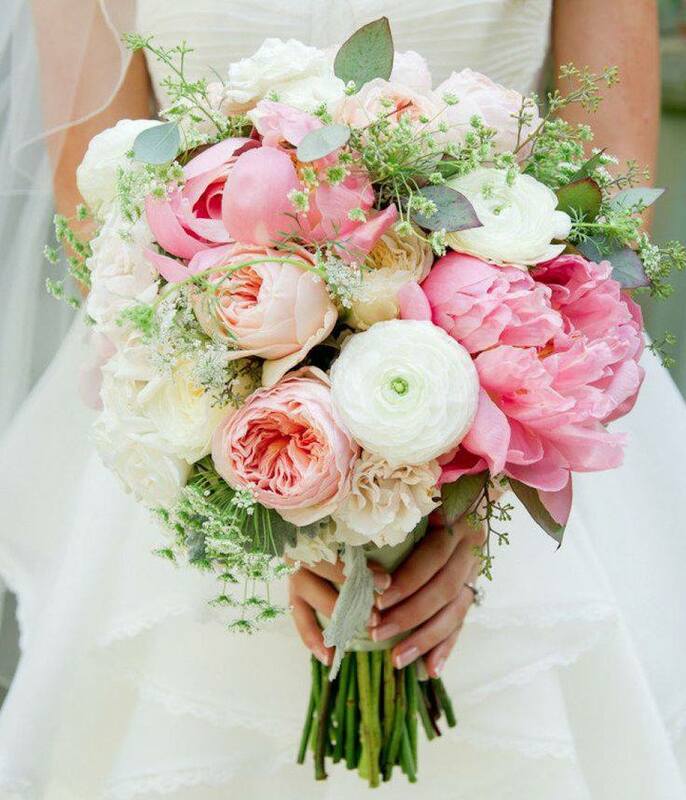 Flowers should coordinate with the venue setup and theme. 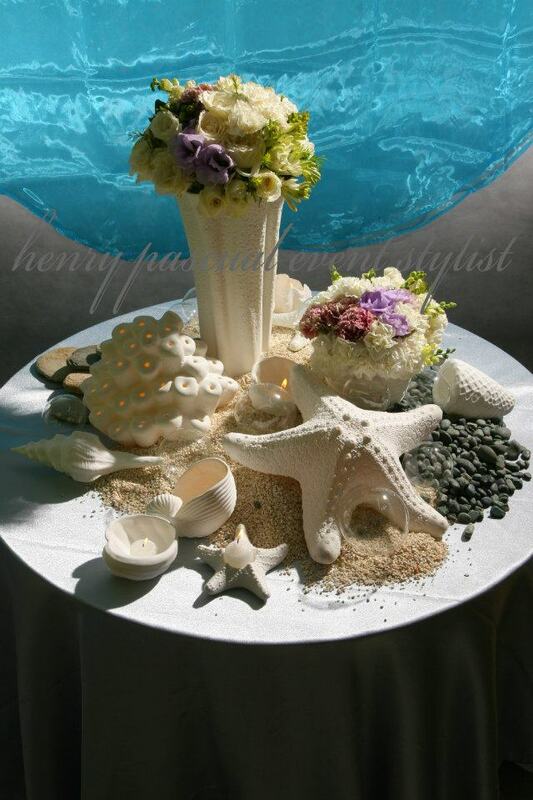 You may also add seashells, pearls and anchors to your wedding flower arrangements. Table Set up. Formal setup can use silverware and chinaware with beach theme designs. Suggested centerpieces are lamps/candles with seashells, colored sand bottles and colored bowls. For formal setups, silver/crystal wares will create an elegant, formal look. For an informal motif, you can have guests eat in banana leaves or large seashells and drink in fruit shells. Instead of the usual carpet flooring, the couple may opt for bamboo or abaca mats. Flower petals or seashells can be scattered in strategic corners. Cake. Cake frostings easily melt in a non-airconditioned venue. Choose fondant cakes rather than soft icings and buttercream. Seashell candies; fresh flowers such as orchids, pearl clusters and sugar flowers; fresh fruits like cherries, strawberries can be used to adorn the wedding cake. As for cake toppers, seahorse, dolphin couple or shell rings may be used. Food. Foods that are cool and refreshing are good choices for daytime weddings. Cold salads, less saucy viands, and cold tropical fruits would go well on the menu. On the other hand, barbecues and grilled foods are appropriate for a night celebration. Music. For a more romantic setup, an orchestra or soloist may play classic and romantic, old songs. Less informal yet solemn ambiance may use acoustic setup. Lively, informal atmosphere may dance to the beat of drums and maracas. Lights. If the wedding is to be held in the morning, then minimum lighting will do fine. For night weddings with formal theme, lamps and/or candles would bring elegance. Just be sure to put candles inside bowls or glass casings to protect them from strong winds. For informal setups, torches and bonfires will surely create a lively atmosphere. Hair. Since the setting is outdoors, both the wind and the sun can ruin the bride’s hairstyle. For a more natural, informal look, use barrettes or headbands to pull the hair away from the face while leaving the back down. For a more formal look, bun or chignon style will look elegant. Make-up. Minimum make-up is appropriate on a day wedding. Use products with sunscreen to protect your face from the sun. Lighten up on foundation and mascara. On evening weddings, choose darker shades to have a more dramatic effect. Attire. The couple’s wedding attire must be coordinated in style and colors. An elegant but simple white dress for the bride and a white polo and pants for the groom suit a formal, solemn atmosphere. Chiffon and crepe are nice fabrics for beach weddings. Sarongs and colored fabrics suit informal ambiance. For footwear, ladies can opt for elegantly hand bead crocheted barefoot sandals or uniquely handcrafted beach wedding foot jewelry for beautiful bare feet and toes! Men can go for leather sandals or bare feet as well. Invitations. An invitation with seashell designs or with a sand texture will help set the mood for your beach theme. A wedding ‘message in a bottle’ is also a nice choice. Souvenirs. Small bottles with shells or colored sands, organza bags filled with seashells, tin cans with sand dollar cookies, candles with sea-inspired holders, and shell bracelets are just some of the possible beach wedding favors. Restrooms. If the ceremony is to be held on a hotel or resort beach, notify all guests to the exact location of the bathrooms. If it takes place on a remote area near the beach, consider renting toilets if none are available nearby. Weather. Have a back-up plan in case of bad weather, whether it’s an alternate location or an extra tent to move to. Have an area that’s out of the sun if your wedding is during the day, or a place where guests can warm up if your wedding is at night. This is especially important if some of your guests are elderly, frail or prone to sunstroke. A tent works well during the day. Time. The best times for a wedding ceremony are either in the morning around 6:00 am or in the evening around 5:30 pm. Beaches are less busy in the mornings while evenings provide cooler atmosphere than mid-day. Rules. Make sure to have the necessary permits if you plan for a public wedding. Also, be reminded of certain restrictions such as loud music, electricity and the space for the reception. Turn Your Dream Beach Wedding into Reality at Subic Grand Seas Resort!